Tomorrow is December. Today I wore a sundress. Despite my lack of recent postings (thank you, senior year) I have been spending the -15% of free time that I have in the kitchen. I’ve been drinking hot apple cider more frequently than my inevitable cavities probably appreciate. I made several pies. Thanksgiving was cobbler-y and cornbread-y and pumpkin-y. Things have been tasty and Autumny and nicely spiced. However, I feel kind of… disrespectful, almost, consuming all of these things when there is a blatant lack of clouds/rain/snow/anything fall-ish to make this season feel real. Here in Southern California, our seasons are like botoxed vampires. They don’t change. Please stop grumbling about your frozen driveways. There are snow-deprived children in Los Angeles. Shovel for us. However, I don’t know if I’m just more observant this past week, or if someone actually drove little bits of New England across the country and planted them in my town. I almost drove over a curb today because I couldn’t take my eyes off of the most beautiful patch of crimson and orange trees that anyone could ever imagine. Did I just admit that? Sometimes I get lost in the leaves. 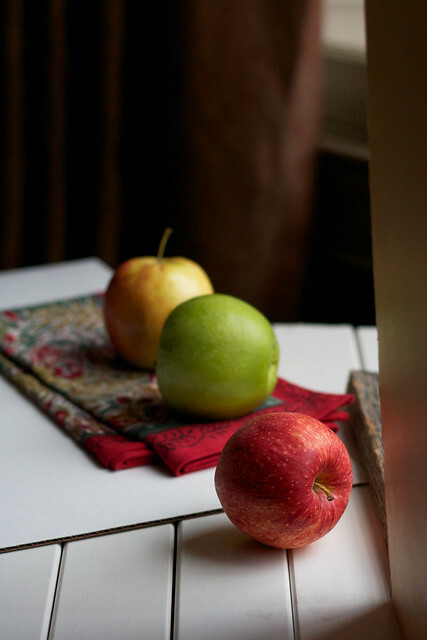 Why am I talking about leaves and showing you pictures of apples? I don’t know. I like apples just as much as I like leaves, I guess. And also, I made caramel apple cinnamon rolls for you. Well actually for my French class but I won’t tell you that because I want you to feel more special than I already think you are. They were sticky and messy and sweet and salty and delicious and a lot more adjectives but I’ll stop there. They feel like fall.. even in eternal summer land. 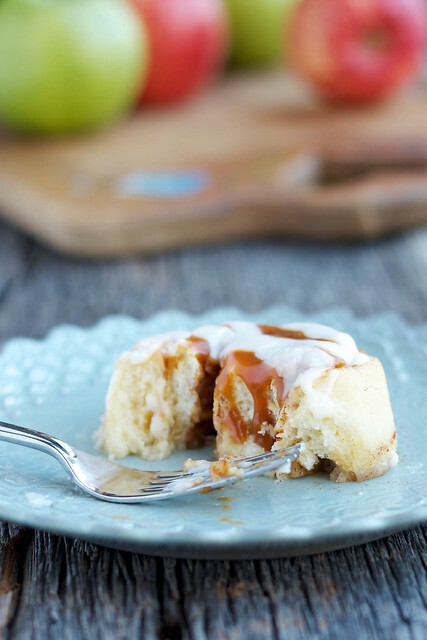 So whether you’re covered in snow or covered in barely anything because it’s so freakin’ hot out, I advise you to make cinnamon rolls, fill them with apples and drown them in salted caramel sauce. You’ll be happy either way. Melt the sugar over medium to moderately high heat in a larger pot than you think you’ll need–at least two or three quarts, whisking or stirring the sugar as it melts to ensure it heats evenly. Cook the liquefied sugar to a nice, dark copper color. Add the butter all at once and stir it in, before turning off the stove and pour in the heavy cream (The sauce will foam up quite a bit when you add it; this is why you want the larger pot. ), whisking it until you get a smooth sauce. 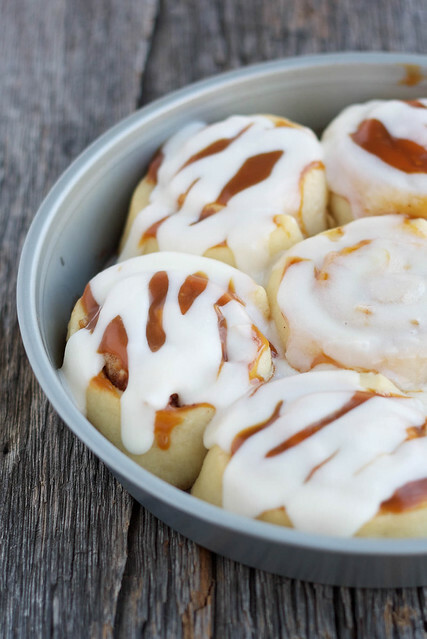 Pour it into mason jars until your cinnamon rolls are complete. Refrain from eating with a spoon. When doubled in size, punch down dough. Roll out on a floured surface into a 15 by 9-inch rectangle. Spread melted butter all over dough. Mix sugar and cinnamon and sprinkle over buttered dough. 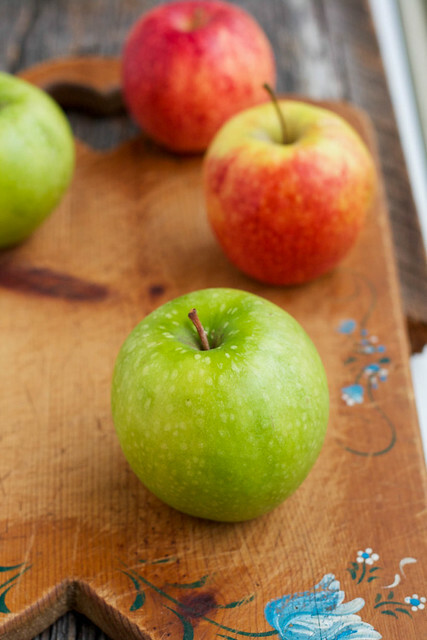 Sprinkle with apples. Beginning at the 15-inch side, role up dough and pinch edge together to seal. Cut into 12 to 15 slices. Coat the bottom of baking pan with butter. Place cinnamon roll slices close together in the pan and let rise until dough is doubled, about 45 minutes. Bake for about 30 minutes or until nicely browned. Meanwhile, mix butter, powdered sugar, and vanilla. Add hot water 1 tablespoon at a time until the glaze reaches desired consistency. 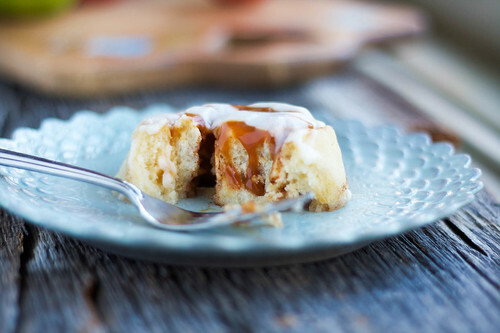 When the rolls are still warm, place 1-2 tablespoons of caramel on each, let it melt, and smooth it out. Drizzle the glaze on top. Enjoy. hi can you make me some? they look amazing! I understand the lack of seasons thing (I’m from South Carolina), but now that I go to college in Scotland, I get all the cold I could ever want!